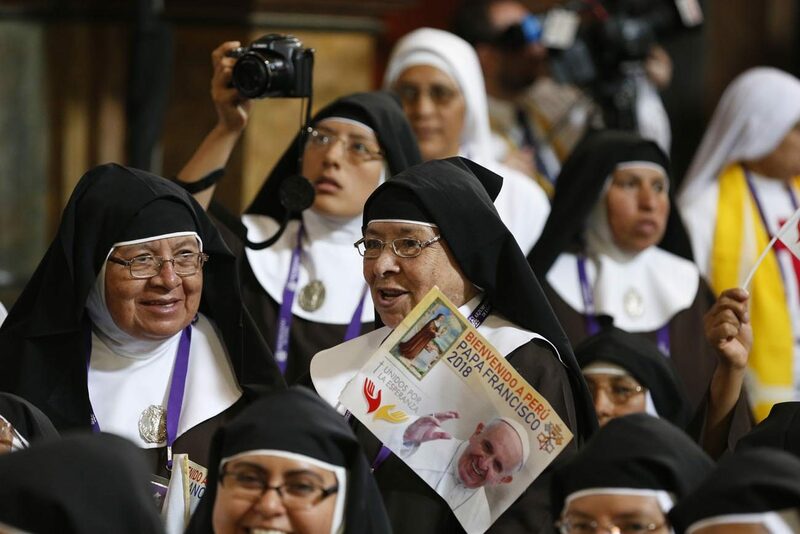 The pope began his final day in Peru, Jan. 21, by joining contemplative nuns in praying mid-morning prayer at the Shrine of the Lord of the Miracles in Lima. Devotion to the Lord of the Miracles dates to the mid-1600s, when an African slave painted a crucifixion scene on a wall in Lima. According to tradition, the archbishop sent workers to destroy, erase or paint over the image, but each effort was miraculously frustrated. In 1687, a violent earthquake leveled the city but left the wall with the image unscathed. The devotion received official approval, and for centuries, a replica of the original image has been carried in procession every year. As the sisters chanted the prayer, the pope followed along, sitting in front of the sacred image revered by the Peruvian faithful. He also asked them to pray “for the unity of this beloved Peruvian church which is tempted by disunity.” The pope would echo that message a little later when he met with the country’s bishops. But before meeting the bishops, the pope stopped at the Metropolitan Cathedral of Lima where he prayed before the relics of Peruvian saints, including St. Turibius of Mogrovejo, the 16th-century Spanish archbishop of Lima and patron saint of Latin American bishops. Known for his tireless efforts to unite the church in Peru, St. Turibius was dubbed “the protector of the indigenous” for his efforts in evangelizing the native populations and translating the catechism into the native languages of Quechua and Aymara. “We have to be able to speak their language,” the pope said. “We need to get to the places where new stories and paradigms are being born, to bring the word of Jesus to the very heart of our cities and our peoples. The evangelization of culture requires us to enter into the heart of culture itself, so that it can be illuminated from within by the Gospel. Bishops also need this “episcopal spirit of prophecy” that is not afraid of denouncing abuses against their flock. “There can be no authentic evangelization that does not point out and denounce every sin against the lives of our brothers and sisters, especially those who are most vulnerable,” the pope said. Taking advantage of being ahead of schedule, Pope Francis spent some time taking questions from the country’s bishops, listening to their concerns and accepting requests to pose for photos with some of them. Among the topics the bishops raised was the upcoming Synod of Bishops on the Amazon. The pope said he first heard of the plight of the people of the Amazon during the Fifth General Conference of the Bishops of Latin America and the Caribbean in 2007 in Aparecida, Brazil. “Eight years later came ‘Laudato Si” and I began to understand. The natural reserves were declining, so was the cultural wealth of the people and I didn’t know. Well, I did know but there I began to understand,” he said. The pope ended the morning praying the Angelus with Peruvian young people and inviting them to get involved with the next synod, which will be this October and focus on youth. “Your faces, your questions and your lives are important for the church, and we need to give them the importance they deserve,” he told them. Look to the saints of Peru as examples of hope and don’t be discouraged “about ourselves or about others,” he told them, adding that things in life that are hard to accept cannot simply be digitally enhanced. “There are pictures that are very nice, but completely fake. Let me assure you that the heart can’t be photoshopped, because that’s where authentic love and genuine happiness are found,” Pope Francis said.